In the heart of global capitalism, the six million New Yorkers who rely daily on public transportation are facing increasing hardships. The Metropolitan Transit Authority (MTA) – the biggest public transportation system in the U.S. – is descending into a deep crisis. 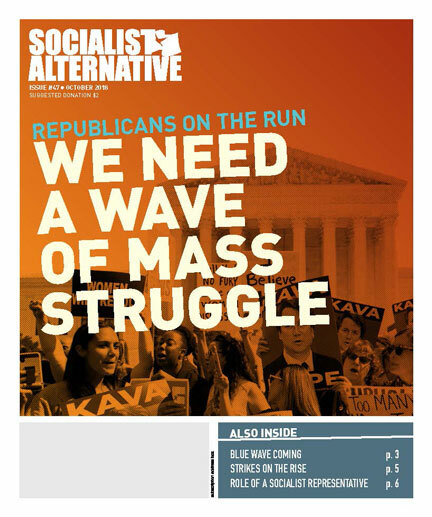 Newspapers have labeled the recent string of problems “The Summer from Hell,” and it’s likely to be followed by a fall and winter from hell too unless a powerful grassroots challenge to establishment politics is built. Within the past two months, two subway trains and one Long Island Railroad (LIRR) train have derailed, with at least 73 riders injured as a result. Subway delays have become a hated fact of life for workers, with the number of delays across the system now well over 70,000 per month (up from 28,000 per month in 2012). 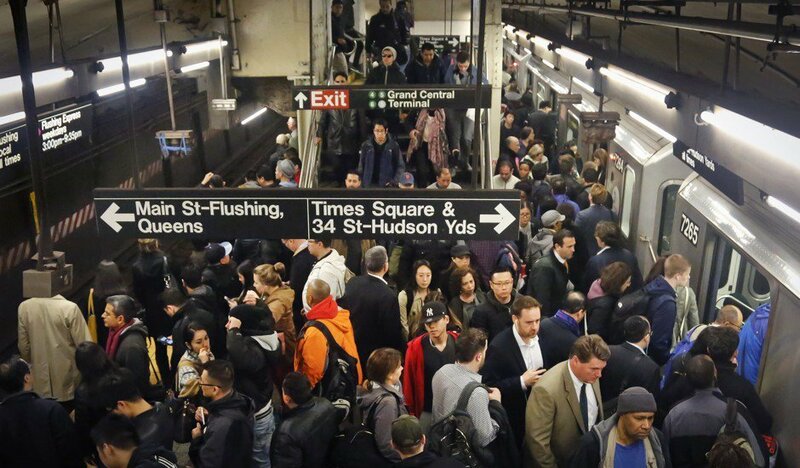 Pictures of crowded subway platforms at rush hour have gone viral around the world. Overcrowding in the New York City Subway. Since 1990, subway ridership has doubled. “But the number of subway cars has barely budged, and the miles of track have actually decreased slightly.” This has led to overcrowding, one of the most important reasons for the recent problems: “Congestion problems tend to snowball as the system reaches full capacity, and additional riders make it run slower — delays due to technological problems have roughly doubled since 2012, but those due to overcrowding have jumped by over fivefold” (TheWeek.com). A recent survey by the City Comptroller found that 74% of all transit riders have been late to work because of subway delays in the past three months, with 18% reporting that they had been reprimanded by their boss. Even worse, 13% said that they had lost wages because of delays and 2% have lost their jobs. The current MTA crisis is not merely an inconvenience for workers, it is destroying their livelihoods! Over 42% of poor New Yorkers, especially people of color, have reported serious delays “most of the time,” compared with 34% of higher-income residents. The subway system is clearly operating to serve the financial system of world capitalism with Manhattan having the most access. At the same time, entire areas in the outer boroughs, primarily the poorer areas, are not covered by subway lines, forcing people to walk long distances or take a bus or two to the nearest subway station. So where does the blame lie for the current MTA catastrophe? The place to start is by looking at the way New York Governor Andrew Cuomo has treated the agency. The Governor of New York exerts enormous power over the direction of the MTA, not only through signing off on the agency’s budget, but also by handpicking the CEO, Chairman, and five other board members of the MTA’s 17-person board. Cuomo has consistently filled these positions with well-off appointees who do not depend on public transit, and who therefore have no idea what it is like to deal with a failing system in crisis. Cuomo has also underfunded and diverted money away from the MTA throughout his time as governor. The most egregious recent example of this is the report that Cuomo wanted to take $200 million out of the MTA’s capital plan to pay for LED light shows on various bridges around the city. And even when Cuomo has decided to make funds available, he has given preference to projects that benefit the small minority of people who drive into New York every day – he had no problem making $500 million available to build new cashless toll booths for the various bridges and tunnels into the city. All in all, since 2011, Cuomo has diverted over $450 million from the MTA into other projects. Mayor De Blasio at a transit press conference. The MTA’s official plan touched on many of same areas as the city plan. The plan presented 30 new actions, including a public dashboard for performance and repair status, “clearer and more timely” explanations for delays, increased police presence and enforcement of “quality of life” offenses, more frequent cleaning of stations, and a pilot program to have some standing-only subway cars on the severely overcrowded L train. The MTA plan was estimated to cost $800 million, although there was no clear plan as to where that money would come from. MTA Chairman Joe Lhota was quoted as saying, “Given the nature and severity of the crisis, the most viable and fair alternative is for the city and state to split the costs.” Mayor de Blasio has already stated that the city will not be chipping in money to the proposal because the state already has the funds available. While parts of the MTA’s plan would help relieve some of the short-term problems, it is ultimately inadequate and lacks a clear vision about how to actually improve the system, rather than just stopping the rot. And some of the proposals will actually increase misery for riders! For instance, the proposal to introduce standing-only subway cars would have a disproportionately negative effect on the elderly, disabled, young children, and pregnant women. A similar pilot program in Boston was introduced then quickly shelved for this very reason. What’s clear is that a bold plan to update and improve the MTA system is urgently needed. The real question is: who will pay? Make Wall Street Pay! Tax the Rich! The corporate establishment is trying to avoid paying for the crisis that their policies have created. Going back to New York City’s financial crisis in the mid-1970s, the political establishment, backed by Wall Street, has systematically underfunded the MTA as part of the broader neoliberal agenda to deliver lower taxes on the rich and Wall Street, cuts to public spending and services, deregulation, privatization, and other ultra-free market reforms that benefit the 1% at the expense of the 99%. When the financial system went into crisis in 2008-2009, Wall Street demanded bailouts from taxpayers. We paid with job losses and cuts to services, and then 95 percent of the gains from the recovery went to the top 1 percent. So while profits are at historic highs, so is inequality. Working people should not be forced to pay for another crisis caused by capitalism. We need a massive investment to repair the subway while putting thousands of people to work at good union wages, paid for with a massive tax increase on Wall Street and the rich. Cuomo called for emergency spending of $2 billion after the horrific derailment of the A train at 125th Street in June, but he hasn’t actually provided any money. The governor has the authority to call a special session and pass the needed funding right away. Under pressure from activists, and facing an election year, Mayor de Blasio came out recently in favor of a “Millionaire’s Tax.” The plan would apply a 0.5% tax increase to the income of about 32,000 people who make over $500,000 ($1 million for a married couple) which is less than 1% of the population of New York City. It’s estimated the tax would bring in approximately $820 million annually by 2022, with most of the money going to repairs. While we would welcome a “Millionaire’s Tax,” it remains to be seen if Mayor de Blasio will actually fight for it, or whether it will remain election campaign rhetoric. For the tax to become a reality, it would have to be approved by the state legislature and signed off by the governor. Cuomo opposes a Millionaire’s Tax and the state legislature rejected a similar proposal in the last legislative session. De Blasio is fully aware that it would be virtually impossible to pass this as things stand. What is needed are mass protests to demand immediate passage of a Millionaire’s Tax as a step toward fully funding public transit needs. While taxing the rich would be a step in the right direction, it won’t be enough to make the MTA solvent. Since the 1980s, the MTA has been forced to take on massive debt to maintain and run the system. Currently, the MTA has $38 billion in debt to bondholders and Wall Street banks. About 17 percent of the MTA’s annual budget goes to paying back these debts each year, instead of being spent on repairs and improvements. This debt is larger than the debt of more than 30 countries around the world, and it’s predicted to rise to over $40 billion in the coming years. It is unsustainable and makes any tax increase only a temporary solution. The MTA’s debt is managed by some of the biggest Wall Street banks. We need to demand that the debt owed to the banks and big investors is canceled and that the savings be used to hire thousands of new workers at union wages to help fix the MTA. The New York ruling elite depends on the public transit system to get their workers to their jobs, and they depend on the more than 40,000 transit workers who ensure the functioning of the system every day. But instead of paying their fair share to maintain the system, they have forced riders and MTA workers to bear the cost of the transit crisis. In the last 10 years, the price of a 30-day unlimited MetroCard has risen 50 percent, and the single ride fare rose from $2.00 to $2.75. Unfortunately, there are more fare hikes scheduled in the years ahead. According to a report from the Community Service Society of New York, almost a million low-income New Yorkers spend up to 10 percent of their budget on transit, while one out of four cannot afford their MetroCard. In a city where rents and the cost of living have exploded to astronomical levels, it is time to say enough is enough. We need an end to fare hikes. We need to roll back the price of the fare and immediately introduce reduced-fares for low-income people. We need to fight for all riders and that means fighting against all racist and exclusionary transit-related policies of the establishment. Forced to move around the city, riders occasionally hop the turnstile. Police ambushes in subway stations have criminalized whole communities, with 56% of those arrested black and 33.5% Latino. We should demand the immediate decriminalization of turnstile hopping, increased investment to service poorer areas in the outer boroughs, an end to racist police harassment, and the right of residents from all areas of the city to be represented in a democratically-elected MTA decision-making body. Aside from punishing straphangers, the MTA’s bureaucratic board has frequently tried to pay for the crisis on the backs of MTA workers. Every time the contract between the MTA and the Transit Workers Union (TWU) has come up for renegotiation, the MTA has sought to constrain wage increases and slash medical benefits and pensions. Working conditions for TWU workers have consistently worsened as budget cuts have decimated funding for safety measures. For instance, the subway signaling system is only inspected every 90 days, whereas they were inspected every 30 days in the 1990s. These less frequent inspections make the subway less safe for workers and riders and lead to more delays. Often the establishment will pit riders against transit workers to avoid making the 1% pay their fair share. For example, we may be told that fare hikes are necessary because of the cost associated with the TWU’s union contract. Or, we could be told the flip side: workers must accept lower pay to avoid more fare hikes. New tolls and congestion fees have been proposed by Cuomo to offload costs of transit onto drivers. These are all strategies by the establishment politicians used to avoid making Wall Street and the rich pay their fair share. We must reject these arguments, take steps to develop stronger unity between working-class riders and transit workers to support each other. And crucial to that is demanding that the 1% and Wall Street pay. We can’t rely on the establishment politicians and the Democratic Party. We need to build an independent mass movement that unites commuters, MTA workers, and the unions to demand the transit system we deserve. We need to elect representatives who refuse corporate cash and who are accountable to and will fight unapologetically for working people, not Wall Street. Through systematic campaigning, Occupy-like actions, and mass actions we can rally the growing anger at the establishment and promote an alternative to the failed status quo. If the unions, particularly the powerful Transit Workers United Local 100, were to take more decisive actions to fight for the funding we need, we should support them. Job actions and strikes coordinated with commuters are the most powerful weapon against the current policies of the establishment. Transit strikes threaten the very profits of the most powerful corporations in New York City. The political establishment has outlawed transit and public sector strikes with the undemocratic and anti-worker Taylor Law. In 2005, the leadership of the TWU was shamefully jailed by the establishment for a strike in defense of their jobs and working conditions. We must stand in solidarity with transit workers and oppose the Taylor Law. If our brothers and sisters in the tunnels and buses ever decide that they have no choice but to completely shut down the most important transit system in the world, we should mobilize to the full power of the 99% to support them as part of a broader fight to win the transit system we need. Ultimately, we need to confront the very way the MTA is operated. The MTA should not be run by 17 bureaucrats – all rich white people – who are all essentially under the control of the governor. We need a democratically-run MTA with an executive board made up of people directly elected by the straphangers, the government, and transit workers. Working people have a right to get to work safely and on time. We have a right to a reliable, safe, clean, high-quality, and affordable transit system. Ultimately, the crisis of the transit system is part of a much larger historic crisis of capitalism, a system which puts the needs of profits before the needs of communities, workers, public services, and the environment. We need to build a worldwide movement for socialist change. Tax the rich and Wall Street to fix the MTA! For the immediate convening of a special session of the state legislature to pass a Millionaire’s Tax as a step toward providing full funding for transit. We oppose more regressive measures like consumption taxes or tolls that put the burden on working people. Cancel debt owed to Wall Street banks and big investors! Use the savings to create thousands of union-wage jobs to improve, expand, and develop high quality and affordable service. Solidarity between straphangers and MTA workers! No fare hikes, no attacks on MTA workers’ wages or working conditions! Decriminalize turnstile hopping! End racist police harassment on subways. Rollback fare hikes! For an immediate introduction of reduced fare MetroCards for students and low-income people. Increase the number of routes with Select Bus Service and build more dedicated bus and bike lanes. End Albany’s control over the MTA! For a democratically elected MTA board with representation from the diverse public, transit workers, and city unions. No reliance on establishment politicians! Build an ongoing mass movement to fight for the needs of working people – including affordable housing, health care, jobs, and education – and against inequality, racism, sexism, and all forms of oppression. We need a political revolution! Support independent left, progressive and socialist candidates who reject corporate cash and are genuinely accountable to working people, not Wall Street and developers. Build a new party of the 99% to fight the billionaire class. Fight for a socialist world! Take Wall Street banks and the top 500 corporations into public ownership, and organize the economy democratically to meet the needs of working people, not profits.